May | 2012 | Crystal Water Villas Blog - Lake of the Ozarks! We look forward to seeing many of you for Memorial Day Weekend!! There’s no better time to be at the Lake of the Ozarks. Here’s a list of 10 things to do this Memorial Day Weekend! 1. Watch a fantastic fireworks display! 3. View the lake by air! 4. Turn off your cellphone and enjoy the company of family and friends. 5. Check out the Town & Country Market on the 26th — Handmade crafts and food. 6. Take a moment to remember those who have fought and died for our nation. 10. Kick back, relax, and enjoy your time off!! One of our priorities is to ensure you have peace of mind when you’re staying at one of our beautiful properties. We understand that accidents happen — yes, even on vacation. That’s why we offer a Security Deposit Protection that gives you up to $3,000 in accidental property damage coverage. Prior to this Security Deposit Protection, we asked guests to make a security deposit payment that would be given back after their stay — if the post-stay inspection showed the property was in good order. This security deposit would, at times, be in the hundreds of dollars and in a few cases over $1,000. Now, with the new Security Deposit Protection, guests pay only $30 to cover any accidental damage up to $3,000. This is just another upgrade that we’ve implemented to benefit you! If you have any questions about the Security Deposit Protection, don’t hesitate to ask. Big Surf opened its gates as the first waterpark in Missouri back in 1988 — a quarter century ago! May 26th is their silver anniversary and they are thanking their customers by offering a special discount for Memorial Day weekend. Come and enjoy the park with a full price ticket on Saturday or Sunday and come back on Memorial Day for free! Be sure to visit their website for more information on tickets prices! Also, be sure to head over to Facebook to “Like” their page. If you’re staying with us this weekend, you’ve go to stop by Big Surf!! 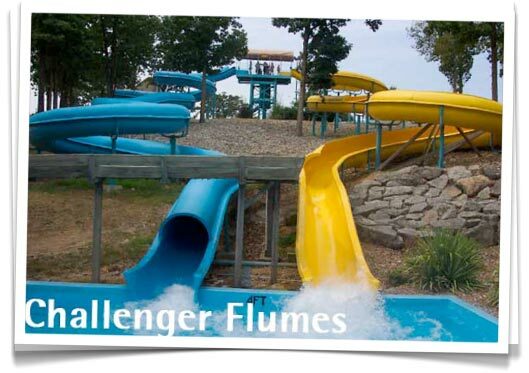 We send out whole-hearted congratulations to the best and biggest waterpark Missouri has to offer! An $800 Savings — Book Soon! By Land, Air & Lake is truly a one of a kind. This beautiful 4500 sq ft one of a kind custom built home features the best of the best. It is fully furnished and especially designed to capture the view of the lake from almost every room in the house. The exquisite floor plan is perfect for formal entertaining or just enjoying lazier time with friends and family. Celebrate your vacation at the Lake! Come stay at the By Land home for 3 nights and get the 4th night Free! That’s an $800 savings! Offer limited to the By Land Air & Lake property. Offer expires 5/31/2012. Offer not valid in conjuctions with any other advertised specials or offers.